The bride and groom lean against the boulder, staring into each other’s eyes with big smiles. As the sun begins to dip below the horizon, the light illuminates the palm trees that outline the property of Esperanza Resort. The last bit of light casts a golden glow on the landscape. Cabo San Lucas during the golden hour is absolutely magical. 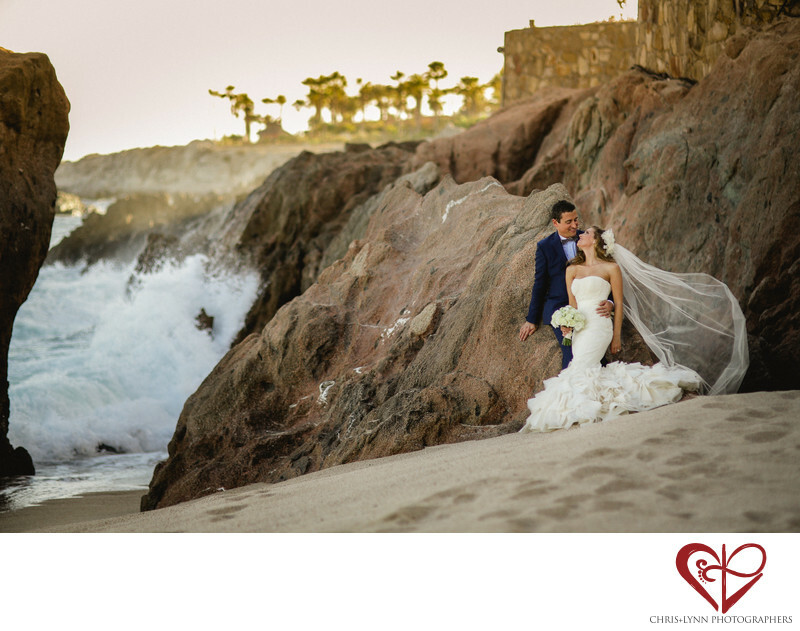 Beyond the newlyweds, the ocean waves crash into the rocky cliffs. The low rumble of crashing waves is peaceful background noise. The breeze from the ocean picks up Erica’s veil, blowing it gently behind her. The newlyweds stare into each other’s eyes with a look that can only be described as true love. 1/5000; f/1.8; ISO 400; 85.0 mm.